It isn’t often I write about current events in this blog, but when I heard about this, I just had to get involved. Although I am not a Catholic, I have developed a soft spot in my heart for the two rural churches where Mark’s ancestors have worshiped for 100+ years. I have spent many hours happily wandering around the quiet and peaceful cemeteries of both St. Joseph in Randolph and in St. Peter of the Fields in Rootstown. Mark’s great-great-great-grandfather, Franz Adam KNAPP, donated the land where St. Joseph Church and School now sit. Dozens of Knapps have attended this school down through the years. So I was very saddened to learn from a recent newspaper article that St. Joseph School is threatened with closure. Due to dwindling enrollment and strained finances, the Youngstown diocese has notified school leaders that St. Joseph will close at the end of the 2011-2012 school term. St. Joseph School has been educating students for 179 years – since 1835. I know from reading the church and school’s website that both are a much loved and important part of the Randolph community. As a result, there is a grassroots effort underway now to fight to keep the school open. 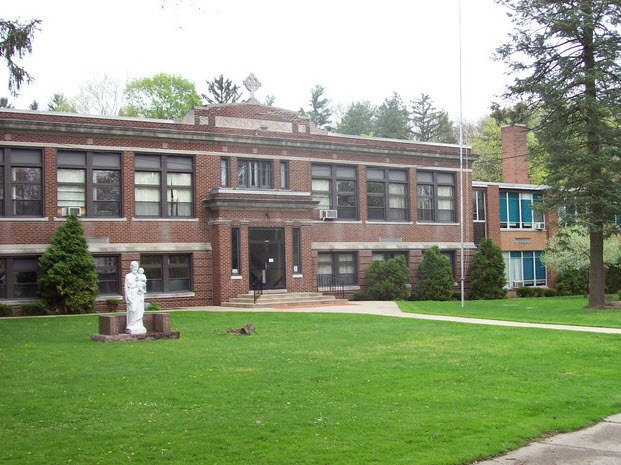 St. Joseph School is one of only two Catholic schools remaining in Portage County, according to a newspaper article. If you are interested in helping to keep St. Joseph School open, please visit a website that Salt of the Earth Farm is hosting. There you can sign the petition to keep the school open and/or donate money to sponsor a child’s education at St. Joseph. To register your children for pre-K-8 grade, call the school office at (330) 628-9555 or visit the St. Joseph School’s website . This entry was posted in Knapp, Local History, Ohio Churches, Photos, Portage County and tagged Save St. Joseph School, St. Joseph Randolph. Bookmark the permalink.